I dropped off my boyfriend at the airport for a business trip and prepped for a small family barbecue celebrating Labor Day. My assignments were easy - some type of hors d'oeuvres and a side. The starter is easy - a triple creme brie, hard salami, crackers and roasted and marcona almonds. 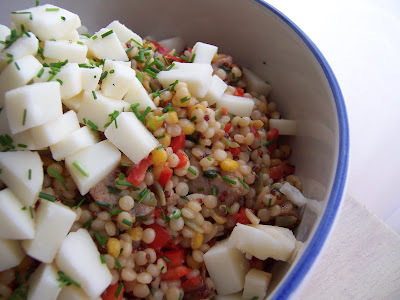 For the side, I did a take on a "pasta" salad with a mix of seeds/grains from Trader Joe's called Harvest Grains Blend with Israeli couscous, red and green orzo, split dried garbanzo beans, and red quinoa. I tossed that with some chopped sweet red peppers, sliced chicken sausage and a tangy vinaigrette - plus the salty and fantastic Halloumi cheese. Delicious and it made TONS so plenty for lunch tomorrow and to send home with my little brother John who is often broke, in college and perpetually starving. Happy Labor Day all - hope it was a relaxing weekend! Bring broth to a boil. Add grain mix and bring to boil, reduce to simmer, cover and let stand 10 minutes (or less if using pasta). Meanwhile, saute sausage in a bit of olive oil until golden brown and cooked through. Let cool, then slice into half moon pieces. Meanwhile, chop peppers, Halloumi and chives. Mix chives, mustard, salt, pepper and red wine vinegar in a deep bowl. Whisk in oil until desired consistency or amount of oil. I used just 1/4 cup. Nine days at the beach in Orange County, Calif. for my annual beach vacation? A whirlwind trip to New York City and Los Angeles for media events to launch the soon-to-open resort I work for? Eating out and cooking the same old thing because it's fast and easy? Or, with me being too tired and hungry to take some decent pictures and share my cooking adventures with the world? The latter is probably the most accurate. 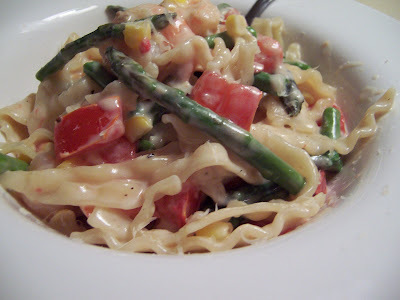 But tonight I am back to cooking (and sharing the results)...so I picked up the best looking, fresh things at the store and made a sweet and comforting pasta...with leftovers for lunch all week. Cheers to good cooking on a Monday night! Bring a large stock pot of water to boil, add ample salt (salty like ocean water - this matters in this recipe because a lot of the ingredients are naturally sweet and you need a balance). Add pasta, stir quickly to prevent sticking. Meanwhile, heat a large skillet over medium heat. Add approximately 1 tbs olive oil. Saute garlic briefly, then add asparagus. Splash with a bit of pasta cooking water to steam asparagus slightly. Add corn and saute briefly. Salt and pepper. Drain pasta, reserving 1/2 c cooking liquid. 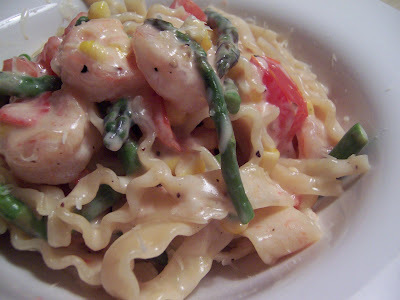 Add shrimp and pasta to skillet. Add pasta cooking water and cream. Simmer on medium heat, tossing, just until sauce is thickened. Add tomatoes and toss briefly. Salt and pepper to taste - add freshly grated Parmesan cheese if desired. Serve immediately with a crisp green salad and a chilled white wine. After an amazing, simple and light meal at T Cooks a few months back, combined with a wandering, confused hour at Sprouts (too many great choices! 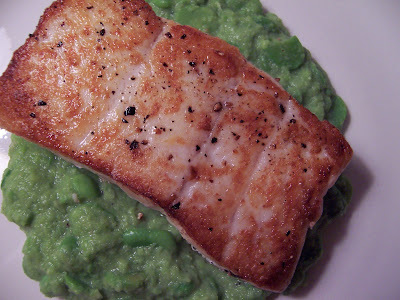 ), I arrived at Halibut with Fava beans for a luscious Saturday night dinner. Peel favas from pod, rinse and then boil for 1 minute in boiling salted water. Shock in ice water. Peel from waxy bean pod. Meanwhile, salt and pepper halibut fillet. Heat 2 pans over medium high heat. Saute fava beans with butter (approx .5 tbs) adding salt and pepper to taste. Puree half cups of favas with water until desired texture and flavor is achieved. Hold on low heat. Meanwhile, sear halibut until just cooked through, careful not to overcook. Literally 2 minutes per side is about right. 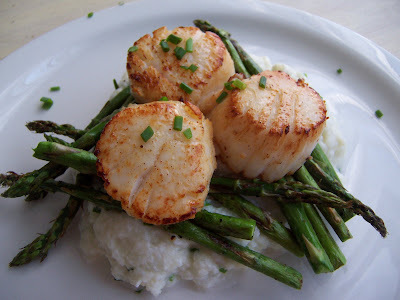 Serve halibut over fava puree. Post 5 p.m. today I inherited a great bottle of wine to the tune of over $55 retail, over $150 restaurant/bar price, already open (but quite recently) and 90% full. And most importantly...delicious and well-reviewed! Immediately I felt tremendous (but positive) pressure to cook something fitting of a wine this good. 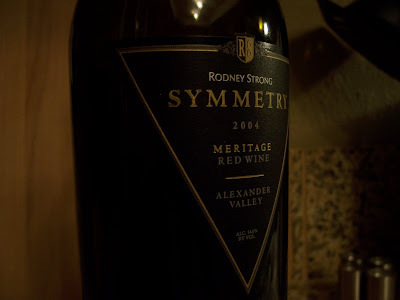 2004 Rodney Strong Symmetry - Alexander Valley Red Meritage was the bottle, and at the first sip I was sold. 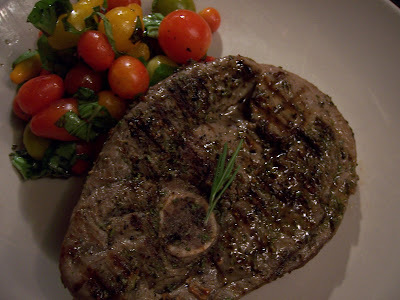 So, to pair, I grilled lamb steaks and served alongside a very refreshing heirloom tomato/basil/citrus salad. I adore inherited wine, a simple supper and being back to blogging again! Chop garlic, rosemary, generous pinch of salt and pepper and a dash of olive oil into a paste. Rub on all sides of lamb steaks. Meanwhile, heat grill pan to smoking hot. At the same time, julienne basil, toss with rinsed tomatoes, salt, pepper, juice of 1/2 an orange and approx .5 tbs olive oil. Set aside. 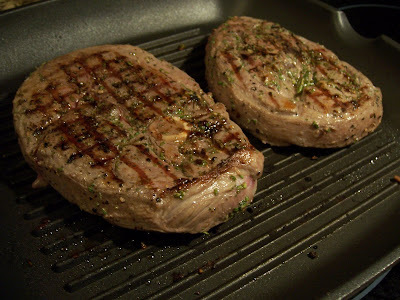 Grill lamb about 2 minutes per side, remove from heat and let stand on grill pan until desired doneness. Rare or medium rare is recommended for this cut of meat. Serve with tomato salad and this (or any other) amazing wine! If you happen to have any wine left over, I highly recommend a deep bath scented with essential oils, candles glowing, Dave Matthews (or your favorite music) blaring, 82% cacao dark chocolate and this wine. Enjoy!!! The weather is warm, swimsuit season is fully upon us here in Arizona, and today I prepped all day for a Mother's Day dinner. But along the way, I needed to eat, and this light salad - which could serve as a first or light main course - was perfect. I also served it as a first course for Brian and I for dinner last night. It's definitely that good. 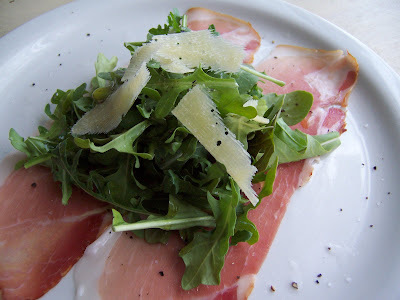 Lay out prosciutto slices on a plate, top with mound of arugula. Sprinkle salt and pepper liberally over top of salad. Drizzle with oil and fresh-squeezed lemon juice. Shave Parmesan cheese over top. Serve. 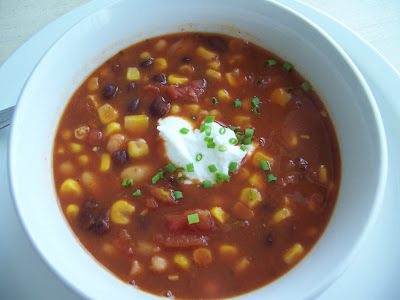 It's well into the 80's every day here, so not sure why any kind of chili sounded appealing, but I went with it and loved the results. 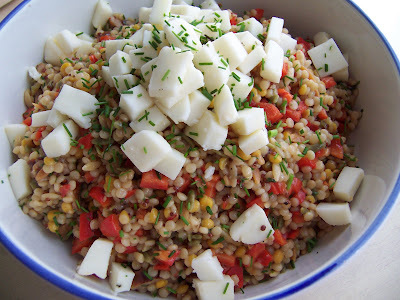 This is seriously easy, very satisfying, delicious and as a pleasant bonus - healthy! Combine, heat, simmer until desired consistency. Taste and adjust seasonings. Serve! I unexpectedly had a long weekend and Brian was out of town...and so I finally cooked something new! Summer definitely feels here in Arizona - today was in the mid-80's and I spent a few hours at the pool. All those things combined inspired this recipe. It's filled with delicious, light summer flavors, and each serving has about 300 calories - perfect for pool (bikini) weather. And, finally, it was delicious.